kt literary » Blog Archive » THE COURIER nominated for Aurora Award for Best Novel! 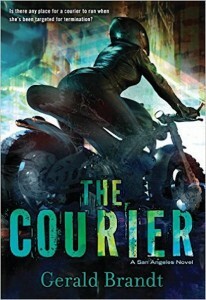 Congratulations to international bestselling author Gerald Brandt – his debut cyberpunk THE COURIER has been nominated for Canada’s prestigious Aurora Award for Best Novel! The Canadian Science Fiction and Fantasy Association (CSFFA) administers the Aurora Award for “excellence in Science Fiction and Fantasy works and activities.” We’re thrilled that Gerald’s amazing book has been recognized and is in such brilliant company! Check out the Aurora Award Ballot for Best Novel here! Kris Ballard is a motorcycle courier. A nobody. Level 2 trash in a multi-level city that stretches from San Francisco to the Mexican border—a land where corporations make all the rules. A runaway since the age of fourteen, Kris struggled to set up her life, barely scraping by, working hard to make it without anyone’s help. But a late day delivery changes everything when she walks in on the murder of one of her clients. Now she’s stuck with a mysterious package that everyone wants. It looks like the corporations want Kris gone, and are willing to go to almost any length to make it happen. Hunted, scared, and alone, she retreats to the only place she knows she can hide: the Level 1 streets. Fleeing from people that seem to know her every move, she is rescued by Miller—a member of an underground resistance group—only to be pulled deeper into a world she doesn’t understand. Together Kris and Miller barely manage to stay one step ahead of the corporate killers, but it’s only a matter of time until Miller’s resources and their luck run out….